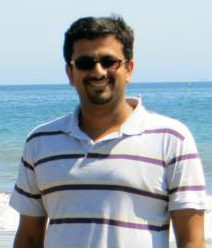 In December, ECE Ph.D. student Anup Menon was one of four student finalists for the best paper award at the 2013 IEEE Conference on Decision and Control in Florence, Italy. His paper, “A Distributed Learning Algorithm with Bit-valued Communications for Multi-agent Welfare Optimization,” was inspired by recent work on learning in repeated games. The paper describes an algorithm that helps individual agents in an engineered multi-agent system "learn" to pick actions that correspond to a system-level (global) desirable outcome (welfare optimal). The algorithm is model free and the agents change their actions only on the basis of their observed individual payoffs/utility. It's proved that convergence is guaranteed so long as the union of implicit communications (an agent observing a change in its utility due to a change in another agents' actions) and explicit communications satisfy certain connectivity properties. An earlier version of the paper was one of five finalists for the best student paper award at the 2013 American Control Conference. Menon is advised by Professor John Baras (ECE/ISR).